NIPPO VINI FANTINI EUROPA OVINI: AMERICAN APPOINTMENT FOR THE #ORANGEBLUE TEAM. American appointment for the NIPPO Vini Fantini Europa Ovini team, engaged from 6 to 12 August in the Tour of Utah, 2.HC category race that saw us protagonists with a victory and important placements last season. 6 the #OrangeBlue riders at the start, led by sports director Mario Manzoni. Reference point in mountain stages is Ivan Santaromita, accompanied by Imerio and Damiano Cima and the experience of Alan Marangoni. Simone Ponzi will be the director of the team, looking for results in mixed stages. Sho Hatsuyama the rider on the attack ready to insert in dangerous actions. Just ended the training camp in Livigno, a fundamental appointment for the #OrangeBlue team ahead of the races scheduled for the second part of the season, which is already time for international competitions. From 6 to 12 August the NIPPO Vini Fantini Europa Ovini team returns to race on the American roads of the Tour of Utah, motivated to repeat the success obtained last season. 7 mixed stages, some of which with sections to be covered at 3.000 meters of altitudine, which lead from St George to Park City. Ivan Santaromita leads the team ready to become a protagonist in each of the stages provided by the Tour. 1 initial time trial prologue and 6 other mixed stages for a Tour of Utah varied and that presents many pitfalls. 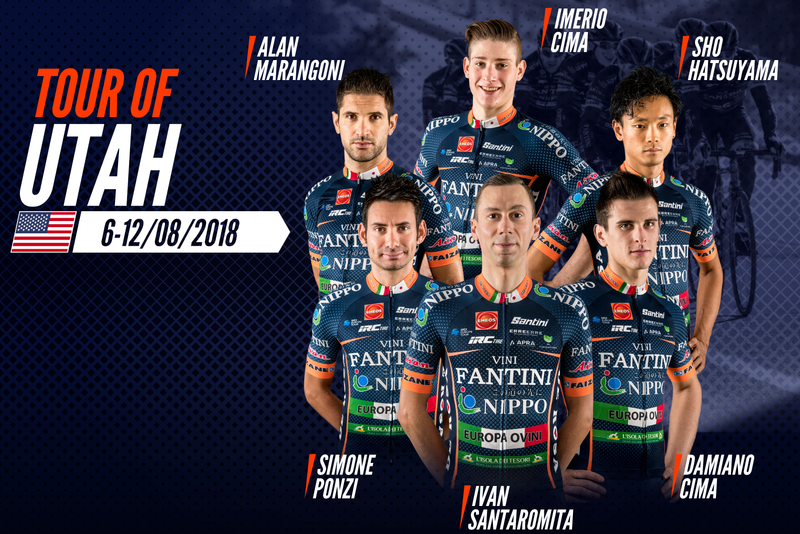 The NIPPO Vini Fantini Europa Ovini team, led by sports director Mario Manzoni, ride the American tour with a balanced line-up, full of athletes able to be protagonists in one or more stages. For the great climbs, some of which at an altitude of 3.000 meters, the point of reference is the climber Ivan Santaromita, great protagonist in the Italian championships in June and motivated after the training camp of Livigno. Simone Ponzi, together with the brothers Damiano and Imerio Cima, will be the team’s top men in the fast stages, supported by the experience of Alan Marangoni. Sho Hatsuyama will instead be the attacker ready to become a protagonist in the day’s breakaway and in dangerous actions. After last year’s Salt Lake City victory, #OrangeBlue will try to be protagonists in this edition too. On the team car during the stages of the Tour of Utah will be the Sports Director Mario Manzoni, who comments with these words the American race: “It is a very important race for us, the first of the second part of the season. We have a balanced and mixed line up that allows us to be dangerous at any stage scheduled by the Tour. The reference point for the climbs will be Ivan Santaromita, together with Simone Ponzi, the team director and important rider in mixed arrivals. For the “moved” stages we will have the brothers Damiano and Imerio Cima, together with Alan Marangoni. The attacking rider will be Sho Hatsuyama, who has already shown himself in the races of the first part of the season. The only unknown factor will be the altitude, as there are planned stages with arrivals at 3000 meters but, after the intense training period in Livigno, we will manage them to the best “. The Line-up of Tour of Utah: Ivan Santaromita, Simone Ponzi, Damiano Cima, Alan Marangoni, Sho Hatsuyama e Imerio Cima. You can follow live the #OrangeBlue engaged in Tour of Utah on Eurosport 2.